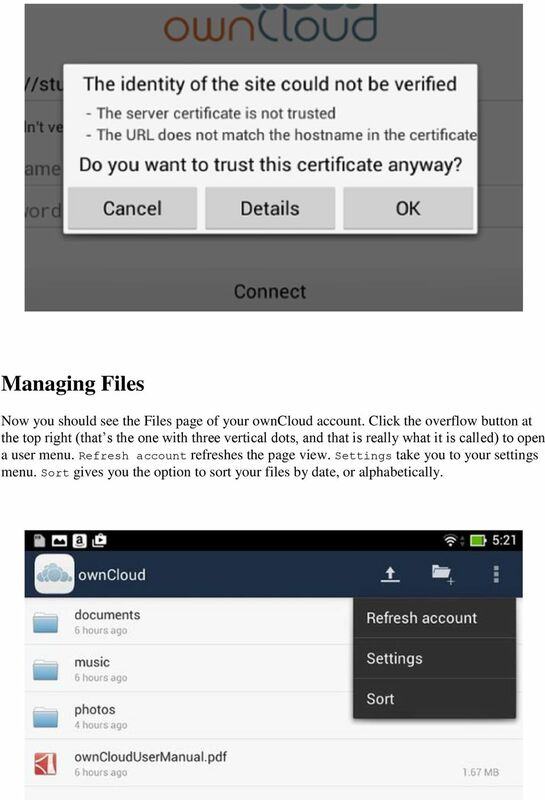 Download "Using the owncloud Android App"
1 Using the owncloud Android App Accessing your files on your owncloud server via the Web interface is easy and convenient, as you can use any Web browser on any operating system without installing special client software. 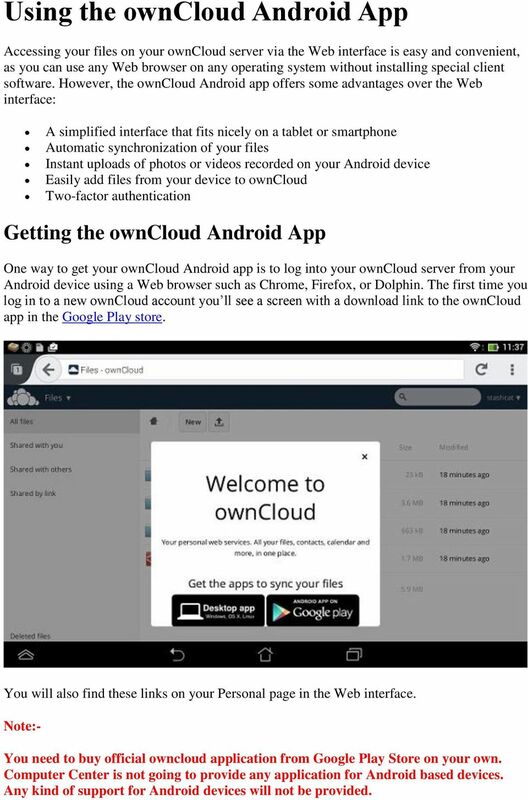 However, the owncloud Android app offers some advantages over the Web interface: A simplified interface that fits nicely on a tablet or smartphone Automatic synchronization of your files Instant uploads of photos or videos recorded on your Android device Easily add files from your device to owncloud Two-factor authentication Getting the owncloud Android App One way to get your owncloud Android app is to log into your owncloud server from your Android device using a Web browser such as Chrome, Firefox, or Dolphin. The first time you log in to a new owncloud account you ll see a screen with a download link to the owncloud app in the Google Play store. You will also find these links on your Personal page in the Web interface. 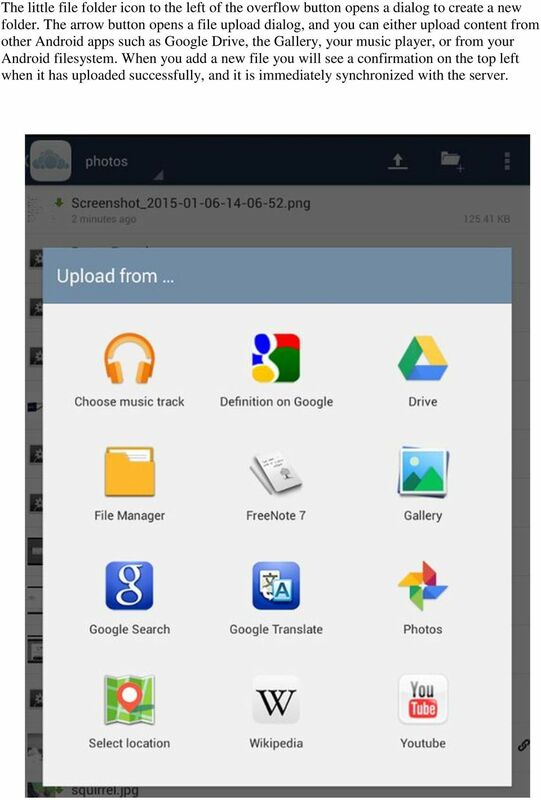 Note:- You need to buy official owncloud application from Google Play Store on your own. Computer Center is not going to provide any application for Android based devices. Any kind of support for Android devices will not be provided. 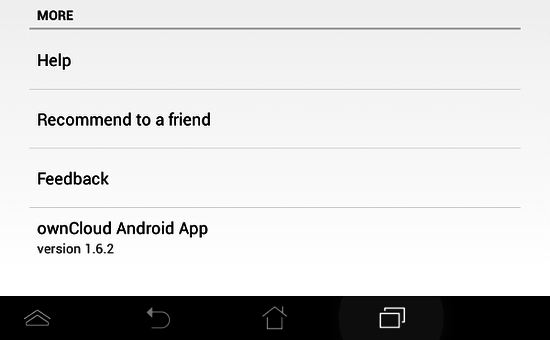 2 Connecting to Your owncloud Server The first time you run your owncloud Android app it opens to a configuration screen. Enter your server URL as LDAP credentials, and click the Connect button. (Click the eyeball to the right of your password to expose your password.) 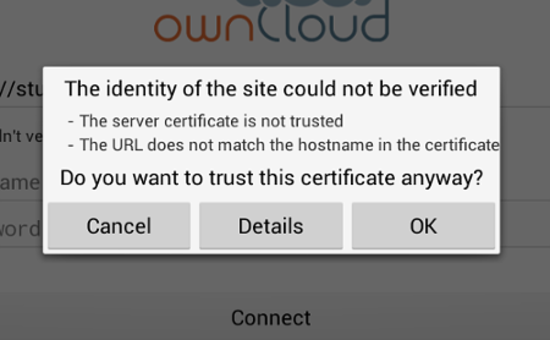 The owncloud app will test your connection as soon as you enter it and tell you if you entered it correctly. If your server has a self-signed SSL certificate you ll get a scary warning how it is not to be trusted. Click the OK button to accept the certificate and complete your account setup. 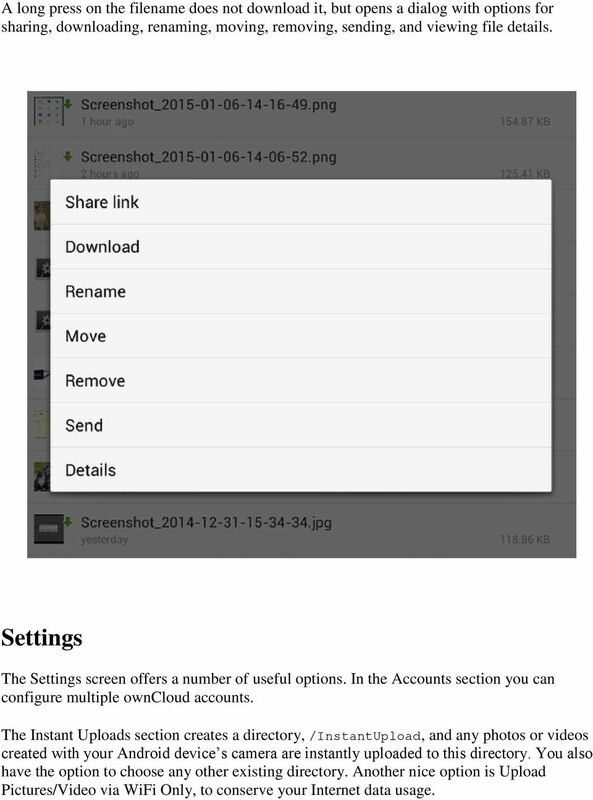 3 Managing Files Now you should see the Files page of your owncloud account. Click the overflow button at the top right (that s the one with three vertical dots, and that is really what it is called) to open a user menu. Refresh account refreshes the page view. Settings take you to your settings menu. Sort gives you the option to sort your files by date, or alphabetically. 4 The little file folder icon to the left of the overflow button opens a dialog to create a new folder. 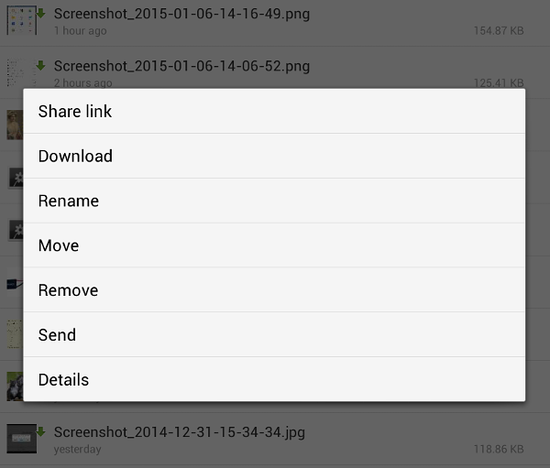 The arrow button opens a file upload dialog, and you can either upload content from other Android apps such as Google Drive, the Gallery, your music player, or from your Android filesystem. When you add a new file you will see a confirmation on the top left when it has uploaded successfully, and it is immediately synchronized with the server. 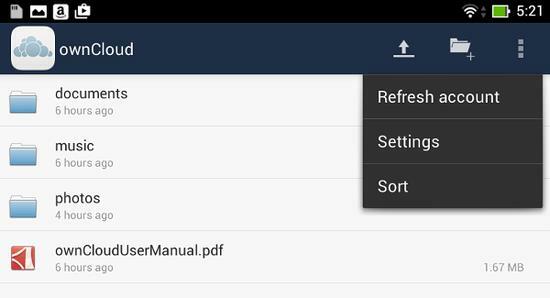 5 All files (that you have permission to access) on your owncloud server are displayed in your Android app, but are not downloaded until you download them. Downloaded files are marked with a green arrow. Download and preview a file with a short press on the filename. 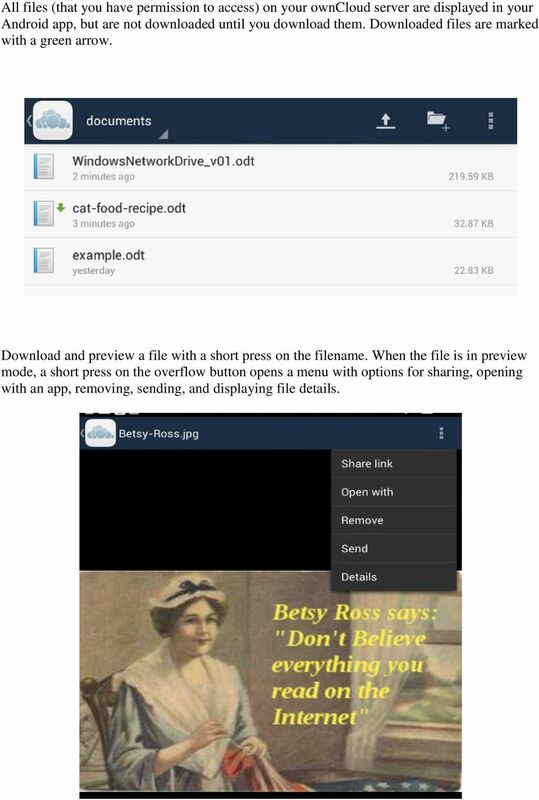 When the file is in preview mode, a short press on the overflow button opens a menu with options for sharing, opening with an app, removing, sending, and displaying file details. 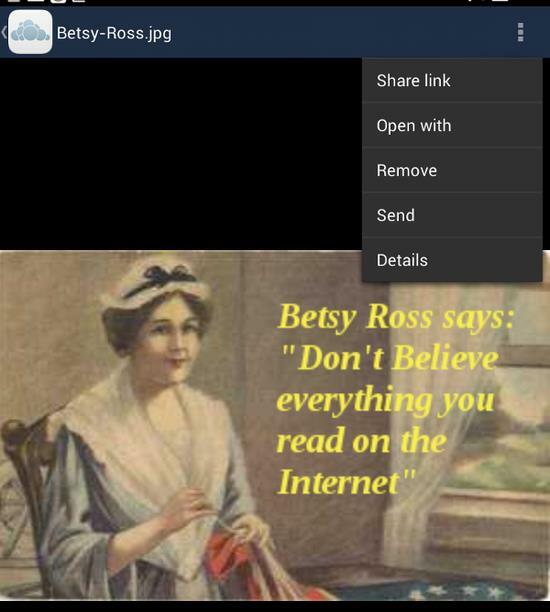 6 A long press on the filename does not download it, but opens a dialog with options for sharing, downloading, renaming, moving, removing, sending, and viewing file details. Settings The Settings screen offers a number of useful options. In the Accounts section you can configure multiple owncloud accounts. 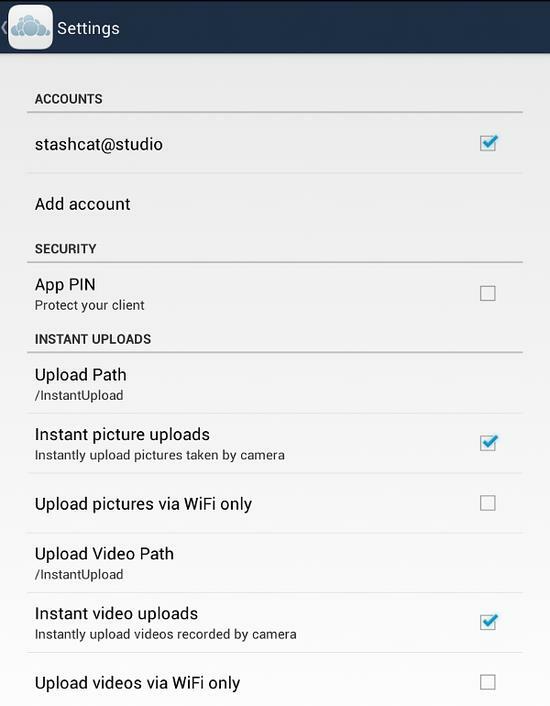 The Instant Uploads section creates a directory, /InstantUpload, and any photos or videos created with your Android device s camera are instantly uploaded to this directory. You also have the option to choose any other existing directory. Another nice option is Upload Pictures/Video via WiFi Only, to conserve your Internet data usage. 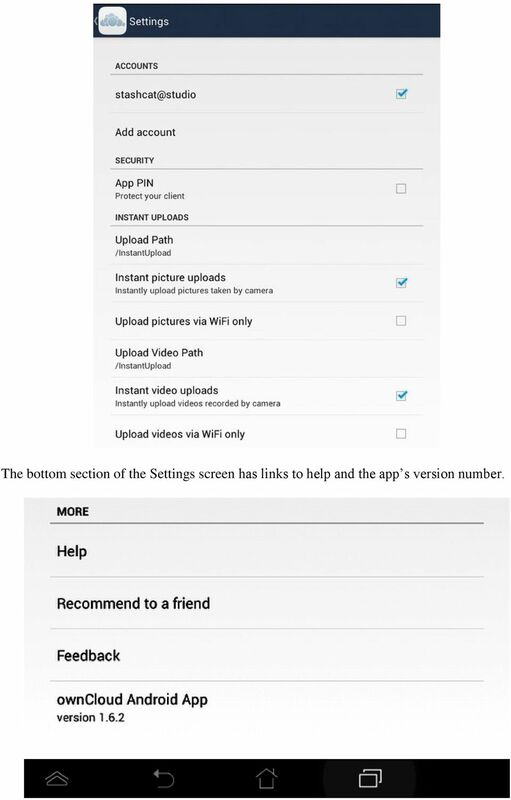 7 The bottom section of the Settings screen has links to help and the app s version number. You can view, download or upload files through the WEB interface or FTP link depending on Type of access you have been granted. FAMILY. Reference Guide. Pogoplug Family. Reference Guide. 2012 Cloud Engines, Inc. All Rights Reserved. Step 1. Step 2. Open your browser and go to https://accounts.bestcare.org and you will be presented a logon screen show below. Motorised IP Video surveillance camera for smartphones, tablets and PC / MAC. Protect your home and family remotely! User s manual for Android Application Thanks We thank you for choosing Aquila Vizion.